Yes, I know. Comfort food has many names and shapes. Yours could be macaroni and cheese or your mother’s famous soup. Mine has a name too: Beef Tostadas; a flat crispy fried corn tortilla with Shredded beef or even with chicken or just plain beans, garnished with lettuce, tomato, onions and fresh cheese without forgetting a good salsa to enhance the flavors. Some days when I find myself feeling the “nostalgia” of missing my home country, is the perfect excuse to prepare these delicious tostadas, listening to one of my favorites romantic Mexican radio stations via the internet. This combination seems to cure all kind of “blues” I may have. And for a moment, everything seems fine. It’s all good! (It will be interesting to know what are some of the comfort foods of other cultures). Antojitos must be one of the most missed dishes for any Mexican living abroad. Tostadas is just one of the many antojitos that can be prepared with different types of toppings, like chicken, beef, seafood, beans and pork feet. Yes, pork feet indeed! Tortillas were sun-dried since the ancient Aztec times, to make them last longer. Still, some years ago, you could find sun-dried tortillas in popular cities, like Toluca in Central Mexico. It took several days to dry the tortillas, depending on the weather. At home, you can use your oven to dry the tortillas, placing them on a baking sheet, brush them with vegetable oil and cover them with your cooling rack to keep them flat. Then toast at 200 degrees (low temperature) for about 10 minutes. Or, as an alternative, you can deep-fry the tortillas in oil until golden, rigid and crispy. Drain on paper towels. This is the most common method used in Mexico. Note: A day-old tortillas are better for tostadas since they absorb less oil and laying them on your counter overnight will start the drying process. Place a kitchen towel and remove the tortillas from their plastic packing, layer and cover them with another towel. Besides beef tostadas, you can also make the tostadas with other toppings like chicken, ground beef, cooked fish, fish ceviche, pork… Well… you get the idea. You will need 1 pound of Skirt steak, 1/4 pc. of a small onion, 2 garlic cloves, and 1 bay leaf. Place the ingredients in a stock pot filled with water and cook over medium heat. Cooking time will be about 2 hours until meat is tender enough to be shredded. Let it cool, season with salt and pepper. Top the tostada with lettuce, onion, and tomato. Sprinkle with the crumbled cheese and avocado. Serve immediately. 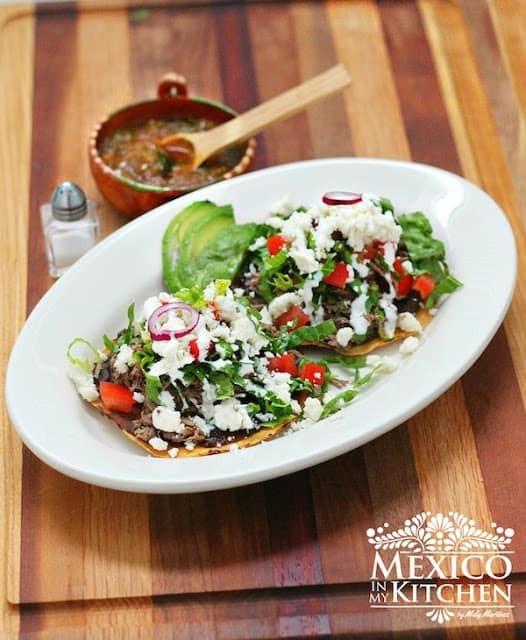 Beef Tostadas; a flat crispy fried corn tortilla with Shredded beef or even with chicken or just plain beans, garnished with lettuce, tomato, onions and fresh cheese without forgetting a good salsa to enhance the flavors. 1 cup crumbled queso fresco Feta and Parmesan are a good substitution. You can use leftover meat from a different cut of meat. Shred it or cut in small bite-size pieces. If you are starting from scratch cook the meat earlier or the day before. I like to cook the meat in the morning and always make enough to freeze and use in other dishes. For this recipe, you will need 1 pound of Skirt steak 1/4 pc. of a small onion, 2 garlic cloves, and 1 bay leaf. Place the ingredients in a stock pot filled with water and cook over medium heat. Cooking time will be about 2 hours until meat is tender enough to be shredded. Let it cool, season with salt and pepper. But I always cook more that one pound. Meat cooked this way is great for tacos, sopes sandwiches and much, much more. Sprinkle with the crumbled cheese and avocado. Let your guests or family members add the cream to their liking. Serve immediately. Do not forget to have a hot salsa and lots of napkins handy. And now, let me ask you: What is the name of your favorite comfort food? The following pictures were my first pictures for this recipe. Also, check our popular Tuna Tostadas. Hola Prieta, te deje una nota en tu blog. Se vé tan delicioso. 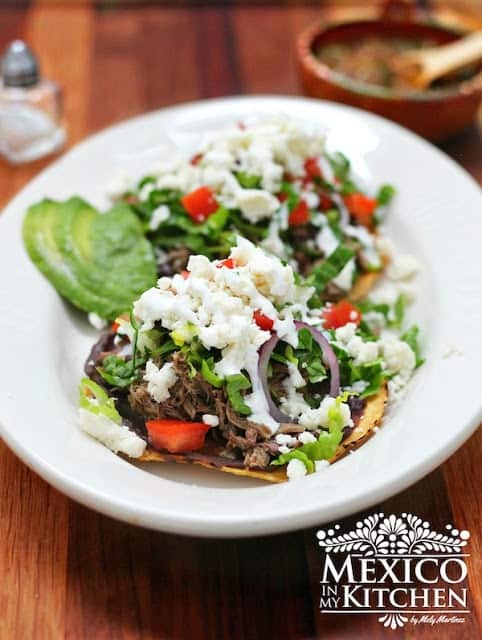 I think, with all its wonderful components, Tostadas could be easily enjoyed for breakfast, lunch and dinner! Try skipping the beans and meat and use guacomole as substitute. Have a meat, bean and guacomole tostado trio for dinner! Thanks for sharing you tostadas combination. I love the beans and fresh cheese combination.